These soaps for for ADULTS over the age of 18 that are NOT offended by body parts. If you are under 18 or easily offended, **PLEASE** do not look at the soap items in this category. These ADULT soaps make excellent bridal/wedding shower gifts or prizes, bachelor/bachelorette party gifts or prizes, gag wedding gifts or "Just Because" naughty adult gag gifts. 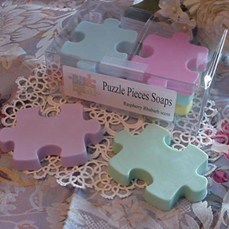 They are made with the same high quality glycerine soap decribed under ALL BAR SOAPS and are scented with commercial grade fragrance oils and colored with FDA approved soap colorants.